انصاری, الهام, مجذوبی, غلامحسین, رحمانی, کاوه, کشفی, محمد. (1397). مطالعه اثر جنس و ضخامت لایه میانی بر جذب انرژی شبه استاتیکی ورق‌های فلزی الیافی. 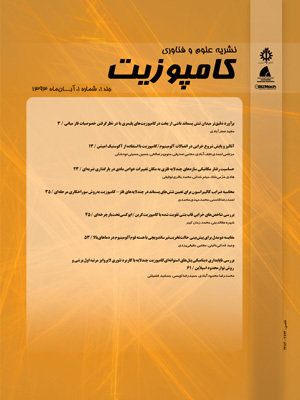 علوم و فناوری کامپوزیت, 5(3), 427-436. الهام انصاری; غلامحسین مجذوبی; کاوه رحمانی; محمد کشفی. "مطالعه اثر جنس و ضخامت لایه میانی بر جذب انرژی شبه استاتیکی ورق‌های فلزی الیافی". علوم و فناوری کامپوزیت, 5, 3, 1397, 427-436. انصاری, الهام, مجذوبی, غلامحسین, رحمانی, کاوه, کشفی, محمد. (1397). 'مطالعه اثر جنس و ضخامت لایه میانی بر جذب انرژی شبه استاتیکی ورق‌های فلزی الیافی', علوم و فناوری کامپوزیت, 5(3), pp. 427-436. انصاری, الهام, مجذوبی, غلامحسین, رحمانی, کاوه, کشفی, محمد. مطالعه اثر جنس و ضخامت لایه میانی بر جذب انرژی شبه استاتیکی ورق‌های فلزی الیافی. علوم و فناوری کامپوزیت, 1397; 5(3): 427-436. در این تحقیق، اثر جنس و ضخامت لایه میانی بر جذب انرژی ورق‌های فلزی الیافی (FML) با مقطع مربعی تحت بار محوری شبه استاتیکی به‌صورت تجربی و عددی مورد بررسی قرار گرفته است. چهار لایه میانی شیشه-اپکسی، کربن-اپکسی، فوم پلی‌یورتان و آلومینیوم 2024 برای ساخت نمونه‌ها در نظر گرفته شد. درحالی‌که لایه‌های درونی و بیرونی تمامی نمونه‌ها، آلومینیوم 2024 انتخاب شده است. نمونه‌ها با استفاده از دستگاه پرس با جابجایی و سرعت یکسان فشرده شدند و ویژگی جذب انرژی آن‌ها شامل نیروی بیشینه، نیروی متوسط لهیدگی، انرژی جذب شده و تعداد چین‌خوردگی هر مورد مطالعه و مقایسه شد. سپس، شبیه‌سازی عددی بر روی نمونه‌ها انجام و مدل عددی به‌وسیله آزمایش‌های صورت گرفته اعتبار سنجی شد. حال، به‌وسیله مدل عددی اعتبار سنجی شده، اثر تغییر ضخامت لایه میانی برای یافتن ضخامت بهینه، مطالعه شد. نتایج پژوهش نشان داد که نمونه ساخته شده با لایه میانی الیاف کربن، بیشترین میزان جذب انرژی و نیروی متوسط را دارا می‌باشد. همچنین، نمونه با لایه میانی فوم کمترین بازدهی را از خود نشان داد. سرانجام با تغییر ضخامت لایه میانی نتیجه شد که بهترین عملکرد مربوط به نمونه‌های است که ضخامت هر سه لایه تشکیل‌دهنده آن با هم برابر هستند. In the present study the effect of change in thickness and material of the middle layer in fiber metal laminates (FMLs) with squared section on the energy absorption is investigated. In this work four types of specimens, based on the change in the material of the middle layer, were produced. In order to fabricate FML samples, Glass-epoxy, Carbon-epoxy, polyurethane foam and aluminum 2024 were utilized as the middle layer and aluminum 2024 for inner and outer layers, respectively. The specimens were then subjected to the compression test and their force-displacement curves were experimentally obtained. Additionally, the effect of the middle layer thickness on the energy abortion performance was studied by numerical simulation using Ls-Dyna explicit code. The numerical model was initially validated by experiment. In conclusion, it was found that the maximum and minimum efficiency were determined for the FML specimen made of Carbon-epoxy and foam, respectively. Moreover, by changing the middle layer thickness, it was numerically demonstrated that the specimen with three layers of the same thickness yields the best absorption energy capability. Alghamdi, A. A. A., “Collapsible Impact Energy Absorbers: An Overview“Thin-Walled Structures, Vol. 39, No. 2, pp. 189-213, 2001. Saathoff, D. G., “Energy Absorbing Vehicle Doors“, to Google Patents, 1994. Ahmad, Z. Abdullah, M. R. and Tamin, M. N., “Experimental and Numerical Studies of Fiber Metal Laminate (Fml) Thin-Walled Tubes under Impact Loading“ Mechanical and Materials Engineering of Modern Structure and Component Design, Vol. 70, pp. 433-443, 2015. Zhen, C., “Review on the Dynamic Impact Characteristics of Fiber Metal Laminates“, Journal of Advanced Review on Scientific Research, Vol. 16, No. 1, pp. 1-11, 2015. Olabi, A. G. Morris, E. and Hashmi, M., “Metallic Tube Type Energy Absorbers: A Synopsis“, Thin-Walled Structures, Vol. 45, No. 7, pp. 706-726, 2007. Mamalis, A. G. Robinson, M., Manolakos, D. E. Demosthenous, G. A. Ioannidis, M. B. and Carruthers, J., “Crashworthy Capability of Composite Material Structures“ Composite Structures, Vol. 37, No. 2, pp. 109-134, 1997. Abramowicz, W., “Thin-Walled Structures as Impact Energy Absorbers“, Thin-Walled Structures, Vol. 41, No. 2–3, pp. 91-107, 2003. Reid, S. R., “Plastic Deformation Mechanisms in Axially Compressed Metal Tubes Used as Impact Energy Absorbers“ International Journal of Mechanical Sciences, Vol. 35, No. 12, pp. 1035-1052, 1993. Ghamarian, A. Zarei, H. R. and Abadi, M. T., “Experimental and Numerical Crashworthiness Investigation of Empty and Foam-Filled End-Capped Conical Tubes“, Thin-Walled Structures, Vol. 49, No. 10, pp. 1312-1319, 2011. Song, J. Chen, Y. and Lu, G., “Light-Weight Thin-Walled Structures with Patterned Windows under Axial Crushing“, International Journal of Mechanical Sciences, Vol. 66, pp. 239-248, 2013. Azarafza, R. Davar, A. and Mahmoodi, A., “Three-Point Bending Test of Metal and Composite Sandwich Panels with Grid Stiffened Core“, 2017. Khosravi, H. and Eslami-Farsani, R., “An Experimental Investigation into the Effect of Surface-Modified Silica Nanoparticles on the Mechanical Behavior of E-Glass/Epoxy Grid Composite Panels under Transverse Loading“, Journal of Science and Technology of Composites, Vol. 3, No. 1, pp. 11-20, 2016. Standard Test Methods for Tension Testing of Metallic Materials, Annual Book of ASTM Standard, 2001. “The Official Site of the European New Car Assessment Programme“, Accessed; http://www.euroncap.com/en. Mallick, P. K., “Fiber-Reinforced Composites: Materials, Manufacturing, and Design“, CRC press, 2007. Abrate, S., “Impact Engineering of Composite Structures“, Springer Science & Business Media, 2011. Murugan, R. Ramesh, R. and Padmanabhan, K., “Investigation on Static and Dynamic Mechanical Properties of Epoxy Based Woven Fabric Glass/Carbon Hybrid Composite Laminates“, Procedia Engineering, Vol. 97, pp. 459-468, 2014. Duleba, B. and Greskovic, F., “Simulation of Loading the Polymer/Carbon Fiber Composites and Prediction of Safety Factors“ International Journal of Engineering and Innovative Technology, Vol. 2, No. 8, pp. 2277-3754, 2013. Pederson, J., “Finite Element Analysis of Carbon Fiber Composite Ripping Using Abaqus“ Master of Science Thesis, Clemson University, 2006. Kashfi, M. Majzoobi, G. Bonora, N. Iannitti, G. Ruggiero, A. and Khademi, E., “A Study on Fiber Metal Laminates by Using a New Damage Model for Composite Layer“, International Journal of Mechanical Sciences, Vol. 131, pp. 75-80, 2017. Nikkhah, H. Guo, F. Chew, Y. Bai, J. Song, J. and Wang, P., “The Effect of Different Shapes of Holes on the Crushing Characteristics of Aluminum Square Windowed Tubes under Dynamic Axial Loading“ Thin-Walled Structures, Vol. 119, pp. 412-420, 2017. Zhang, X. Leng, K. and Zhang, H., “Axial Crushing of Embedded Multi-Cell Tubes“, International Journal of Mechanical Sciences, Vol. 131-132, pp. 459-470, 2017. Chahardoli, S. and Alavi Nia, A., “Experimental and Numerical Investigations on Collapse Properties of Capped-End Frusta Tubes with Circular Triggers under Axial Quasi-Static Loading“ International Journal of Mechanical Sciences, Vol. 134, pp. 545-561, 2017. Graciano, C. Martínez, G. and Smith, D., “Experimental Investigation on the Axial Collapse of Expanded Metal Tubes“ Thin-Walled Structures, Vol. 47, No. 8, pp. 953-961, 2009. Alavi Nia, A. and Akhavan Attar, A., “The Effect of Different Layouts in Internal and External Stiffeners on the Energy Absorption of Thin-Walled Structures with Square Sections“ Archives of Civil and Mechanical Engineering, Vol. 17, No. 4, pp. 997-1010, 2017.